The season of festivals starts in India, now on wards. First comes Nagara Panchami. We prepare two types of ladoos for Nagara Panchami. One is Tambittu and another one is Chigali and we offer these two sweets, popped Jawar, roasted whole gram along with milk to Nagadevata (snake god). I have written about “Tambittu” in my earlier post. Now, I am going to write about “Chigali”, which is prepared from Til (Yellu/Sesame seeds) and Jaggery (Bella/Gud). Sesame seeds are small in shape featuring pleasant nutty flavor and high oil content. Sesame seeds are widely considered as one of the most healthy foods. They are very good sources of B-complex vitamins. The sesame seeds are incredibly rich sources of many essential minerals, especially copper is concentrated in sesame seeds. That is the reason, in earlier days, our ancestors were using sesame seeds in their daily diet. Preparation of chigali is easier than tambittu and no cooking is needed here. These ladoos are tasty, delecious and healthy as well. The stuff prepared for these ladoos, won’t get spoiled, in any condition. No tension of spoiling the dish. Let’s see the preparation of Chigali. Place a wide bottomed frying pan on medium heat, pour sesame seeds in to it. Roast them until they start spluttering or the colour of sesame seeds gets changed to light brown. Take out roasted sesame seeds and pour them into a bowl. Place the same pan on heat again, pour groundnuts into it. Roast them until they start spluttering and start leaving a pleasant aroma. Take out from the heat. Remove the skin by holding in hands and rubbing between the hands. Keep them in a bowl. Crush the Jaggery into crystals (not powder). 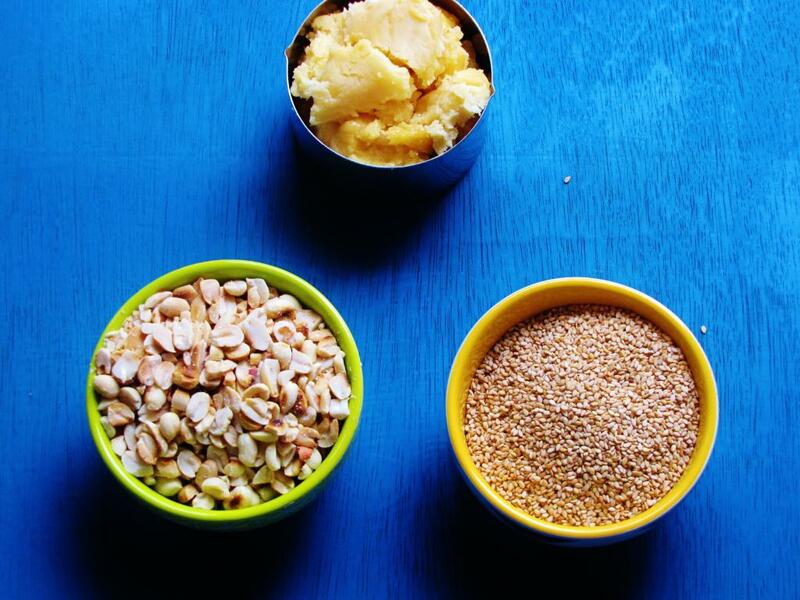 Mix roasted sesame seeds, roasted groundnuts and crystaled jaggery, altogether, in a big bowl. Put some quantity of this mixture in to a medium sized mixer jar and run the mixer to crush the ingredients coarsely and see that they should blend finely. This is the speciality of these ladoos, when we eat these ladoos, there should be a feeling of having granules of groundnuts, til and jaggery. Repeat the same procedure for remaining mixture. After grinding is over, take a little quantity of mixture in hand, clump hands with mixture to tighten it. Slowly using inner palm, rotate it to make small balls. You have to give them cylindrical shape by pressing it by fingers up and down. This is a speciality of Chigali. If you cann’t bind ladoos on the same day, no worries, even, you can bind them on next day, the stuff won’t get spoiled. Isn’t it amazing! Your tasty, delecious and healthy Chigali is ready for Nagara Panchami. I hope, this procedure makes you comfortable in preparing this dish.